I never promised that I would be the lowest price in the region. I cannot do that. Nor, do I feel that I have to do that to fight for my market share. 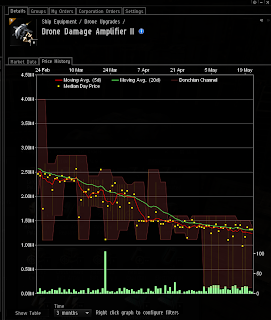 The difference of .01 ISK might keep someone in high sec but it will not lure someone out of low sec. The residents of low sec are my priority and that is where I need to focus my time when I do have a price war with someone. 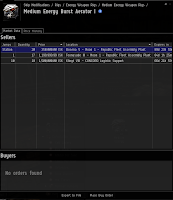 What I promised was reasonable prices based off of Jita sell orders. I feel I am delivering that. Even if someone is .01 ISKing me or whatever handful of change they are tossing to be below my price, in the grand scheme of things, it does not matter. If they feel that they have to undercut my prices in high sec to get sales I am winning the battle. My entry into the market in the middle of March is very obvious. Everything starts to flatten out as I forcibly push the market down by maintaining my prices. 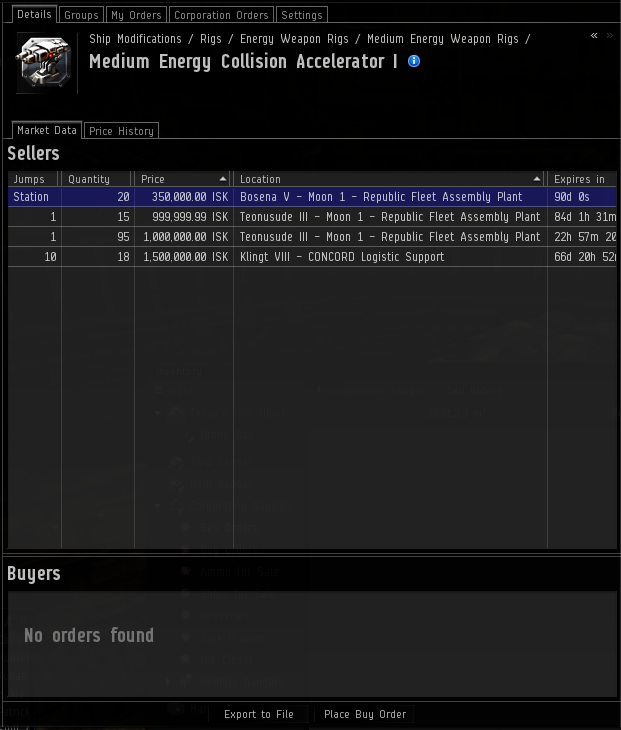 My own price fluctuation are a reflection of Jita's price fluctuation I couldn't keep this particular module stocked more then 72 hours for the first few weeks the store was active. Because TCS is a social project I will introduce items upon request. If the item sells I will continue to stock it. If the item does not move I will apologize but note that it is too special snowflake of a request. I have a lot of listing power but I don't have endless abilities. However, when I do undertake these projects I often see situations like this. The Molden Heath area, in general, is devoid of rigs. I've been working them into my game plan which seems to expand every single time I turn around. That is a different topic, however. What I point out here is that this rig is not an unreasonable rig to list nor an expensive rig to list. However, the two other listings, one is in High Sec and the second belongs to the group that has recently moved into Klingt. That is what I do not want TCS to do to people. 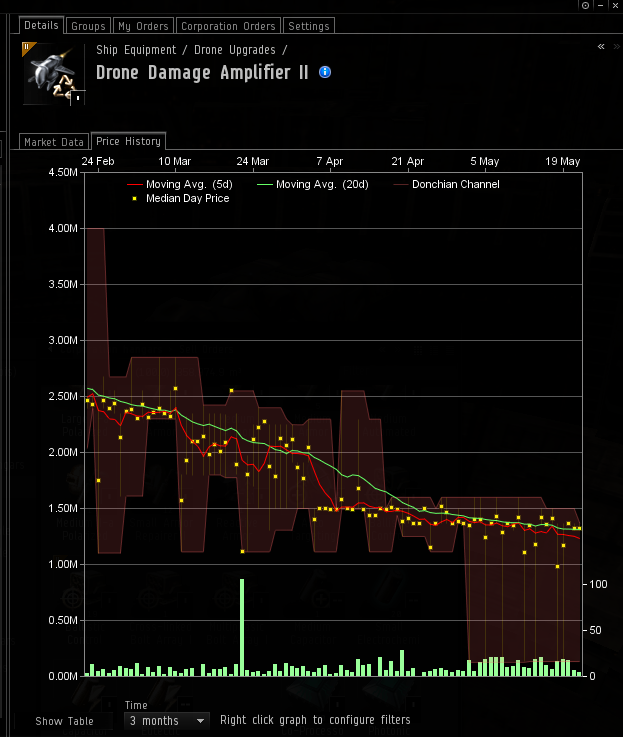 As I explained (probably over explained) to Naughty when she was debating selling her loot in Bosena instead of Rens, I am making my ISK by volume. For a fast, immediate ISK injection TCS is not always going to be the best place. I turn over a large amount of goods every day (around 500M-1B a day now) but I do not sell lots of one thing. If someone comes for a fit they may only need 2 Warrior II's to complete their flight. Therefore, if she is selling two flights of Warrior II's left after a fight she'd slowly get the ISK over several days. I do not think that this is a bad thing but I want her to be aware of the differences between managing TCS as a supply entity and being able to go to Rens or any active hub. It is not that it is a bad thing it is just a different method of ISK accumulation. TCS is about time and volume and the combat of over prices wares. I'm not going to trot down to Klingt and list a market there. If they wish to overcharge their corporation and alliance mates, that is their choice. At least they will not be the only price in the region and people, if they look at the market, will be aware that the prices available to them may be a far cry from their only option. Those last two screenshots scream! There are no buy orders! 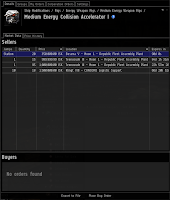 Medium Energy Burst Aerator I is 160K buy, 230 sell at Jita. If you'd put up buy orders for 170-180, local manufacturers could supply you. I mean from their own salvage. What you buy in your station is something you don't have to haul. Since 180 is smaller than 230, if you get excess amount, you can just put into your hauler and sell in Jita for profit. A true trade hub has buy orders. 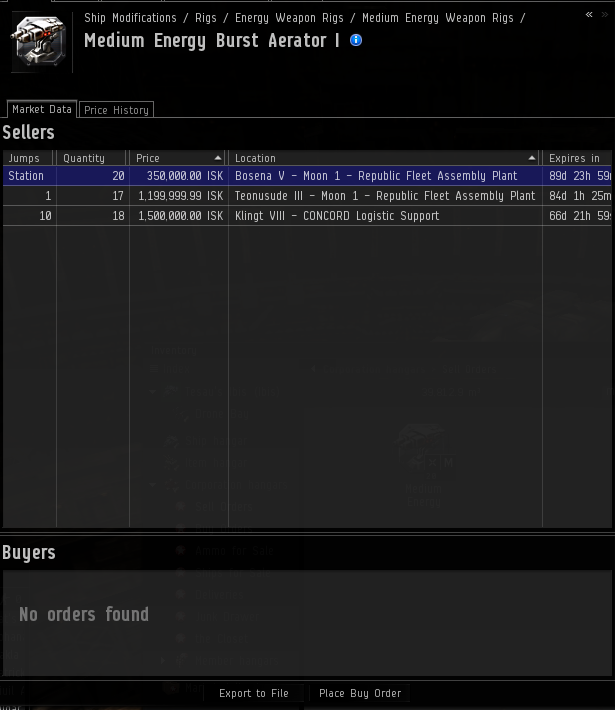 I make a killing by buying implants in Rens and Hek (mostly from Minmatar FW) and sell them in Jita. 10-15% profit and I'm moving 5-10B every second day. 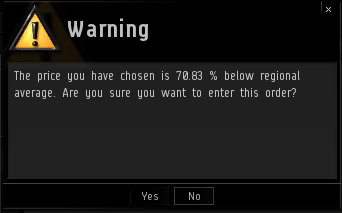 There can be even larger profit in lowsec. Aye. Buy orders are something I will work on and have in some areas. I'm still working on having a steady supply of Battle Cruisers and such. Pick and choose my battles and buy orders for slow moving rigs is one I'm not picking atm. Gev, are you suggesting that Molden Heath industrialists would fly their goods into the most violent system in the region by far to sell to buy orders? I'd love to think you are correct...but somehow I imagine it'd dry up after they lose a few shipments. Buy orders do have an optional range - picking up the goods from all over the region however may be time prohibitive.